Volcano Mist is a unique cultivar that grows up to 8 ft in diameter. Plum tipped leaves and blue-green foliage near the center of this bromeliad stands out in a sunny spot in the landscape. When mature, this variety sends up a rich purple flower stock up to 3 feet tall. 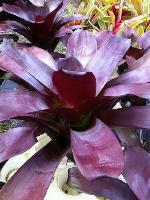 This Alcantarea is another giant Bromeliad. It can reach a size of 6 feet wide. A young plant has slender pale green with silver leaves. The leaves on a mature plant become covered with a silvery white powder.